What a shock and a plan of action! I decided to go on a spontaneous litter pick recently in my local area after finding someone had shoved a large empty plastic bottle in my hedge and although it did a good job of inspiring me I was pretty unimpressed about finding it there. I couldn’t understand why someone would think it was ok to do that! At first glance the roads in my area look neat and tidy and normally I don’t really notice litter. I looked a bit closer and I soon found an empty plastic bag, which I picked up and within around 15 minutes had filled it up to the brim. I was really shocked and surprised at how much rubbish I had found. Have you ever been on a litter pick in your local area or near where you work? I challenge you to go on one today – I reckon you too will be shocked at the amount of rubbish you find! Rubbish can kill animals – either because they mistake it for food and fill their bellies with it or because they get caught up in it. Plastic rubbish can’t biodegrade. Instead it degrades into smaller and smaller pieces, gets into our land, our waterways, our food and eventually back to us. It looks unsightly – who wants to look at a street full of rubbish? Don’t drop litter! This is pretty obvious and I can’t imagine anyone who reads this blog would intentionally but it is easy to drop it by accident. Light rubbish can fall or get blown out of bins, pockets, cars or bags without anyone noticing – try to secure your rubbish so it doesn’t fly away! If you notice any problem areas phone your local council and tell them. They may come out and clear an area that is particularly bad or consider installing rubbish bins (if there aren’t any already). I did this after my walk mentioning the lack of bins and the council said they will send someone to have a look, but am now wondering if bins cause more problems than they solve because the litter isn’t secured like it is in residential bins. 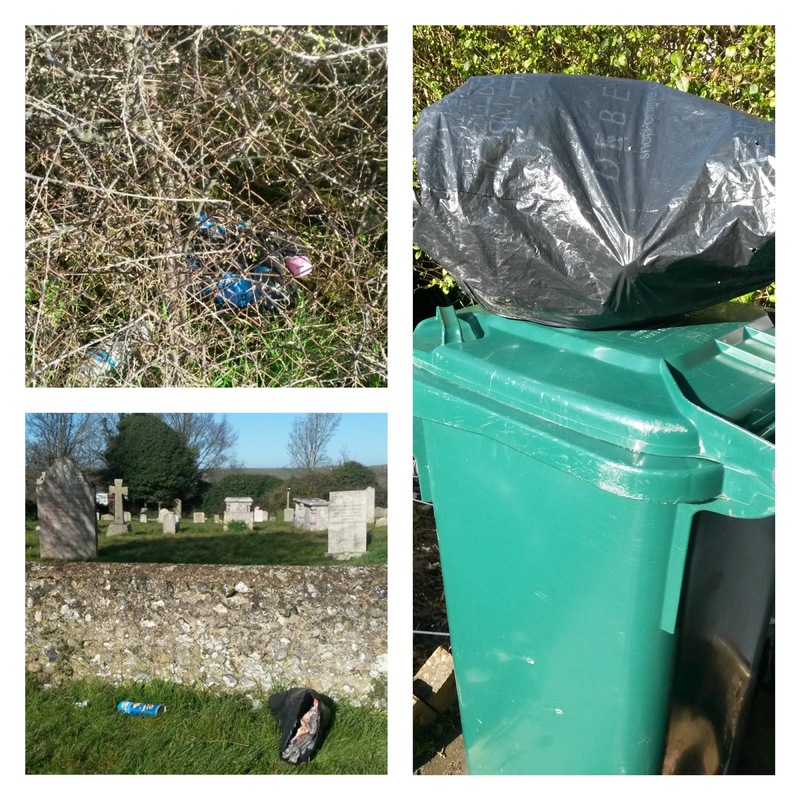 Challenge anyone you see littering (in a nice way and if you feel it is safe to do so) – they might think twice about doing it again if they think they will get questioned or possibly even fined. Get into the habit of noticing litter, reporting hot spots and picking up it as you go about your daily life. Making a positive change like this to your local area won’t take a lot of time and effort and can have a big impact even if there is just one of you doing it, so get ready, set, litter pick! If you liked this post please click like on Facebook, follow on Twitter and follow on Instagram – thanks so much! This entry was tagged eco, fitness, Frugal, get fit for free, Green, litter, litter picking, rubbish, thrifty, trash. Bookmark the permalink. ← The papers say I don’t use toilet paper, shampoo and toothpaste! I regularly pick up litter in my area especially after the bin men have been. My mum was really strict on not littering. Once walking up the road the family in front of us were throwing sweet wrappers down and mum called out "keep Britain Tidy" which was the government slogan of the time. The woman turned round and asked "Why,what's Britain done for me?" We were poor but always taught to keep our environment clean and tidy for all the reasons you stated. Well done for your clean-up. Well done to you too for your litter picking efforts! My street was pretty clean yesterday morning when I set off to central London. When I came home at the end of the day, it looked very different, though. There were lots of greasy papers, empty crisps bags and all sorts of rubbish. I wish I could change it but I will need to mobilise other people on the street for that to happen…I guess the quickest and easiest way to do that is to follow your example and start picking litter close to my house. It could be a good way to connect with your neighbours and litter picking is definitely more fun when you are doing it with other people!